I am handing these out to some great blogs that I have found recently who I think are Trendy! Hence the Trendy Blog Award. BUT.... in order to receive this award you have to promise to share this with 10 other BLOGS that you think are Trendy too! It is just that simple. 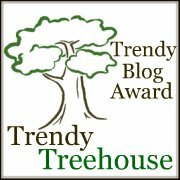 Just post about your award in your blogList your Top 10 Trendy BlogsShare with them andLeave a link to the Trendy Blog Button (so they can grab it too)Make sure you tell them the same, that they need to give this award out to 10 as well. Have fun handing out the Trendy Blog Awards! Hope you all enjoy your lil award. I will be handing more out. I promise. If you want to nominate your blog or any other blog, just fill out our contact form and let me know why your blog is Trendy! YAY - I'm so happy to follow almost everyone already. I'm off to check out the last three. Can't wait to see! Thanks Tara! I had no idea you thought I was that trendy. I feel so special...now how to celebrate? French fries, a glass of wine? Maybe I should wait until after church to celebrate my award. They frown on wine before 9am around here. Weird, isn't it? Thanks for selecting me Tara! I appreciate the kudos! Thanks Tara - You are sooo nice! I really appreciate it! Your magazine sounds like a really fun idea! Thank you so much. There are so many wonderful blogs, I'm proud to be mentioned :). These sound great! I am off to read a few. Congrats Trendsetters! A great choice of blogs.. a couple I'm not familiar with yet, obviously worth checking out. Thanks for posting. Great blogs! Wow Tara, thanks! With all the blogs out there, I am so honored. Trendy...I like it! Thanks so much for the honor. I'm really flattered to me named with a few of my favorite blogs. I'll be checking out the ones I haven't seen yet.